Well the hardest part of my marathon training is done. I ran 161 miles in September. On most days, my legs were full of fatigue, and just getting off the floor after 30 minutes of story time at the library offered new challenges. But I had a great month. 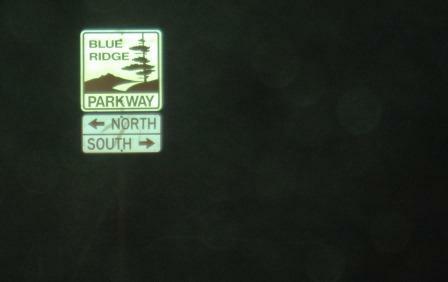 I did all of my long runs on the Blue Ridge parkway, so I could be fully immersed in hill training. I started at the break of dawn. Later in the month, I was lucky enough to see cooler morning temperatures, which certainly made the long runs go by more smoothly. After my longest run, of 20 miles, I treated myself that evening to a Blue Moon Harvest Pumpkin Ale. 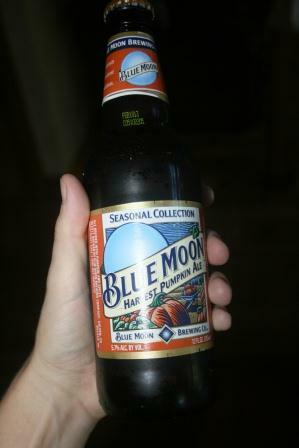 I rarely drink, but I do enjoy a pumpkin beer each autumn to celebrate the arrival of Fall, and I earned this one! 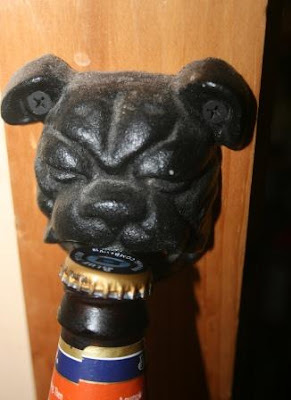 Besides, it gives me an opportunity to use our cute little English bull dog beer opener. Now that the hard part is done, I am tapering. This means I'm significantly cutting back on mileage so my legs will be rested for my marathon. Sometimes tapering involves a lot of mental anguish. Feelings of insecurity can set in - doubts that I've trained hard enough, doubts that I can do another marathon. It's very common, too, for runners to feel the niggles of an injury that wasn't there before. Yes, tapering does strange things to the runner's mind. Mostly, though, I'm just very excited to be registered for marathon #9. Hopefully I'll have good weather and good health on the day of the race, and all those rumored hills will be just hills and not mountains! Do you have anything exciting scheduled for October, readers? Congrats on a great month! It isn't something that we have scheduled, but my brother and sister-in-law are due with their first baby tomorrow, so we have a lot of trips to Massachusetts planned this month...if the baby comes soon anyways! Add to that, no one knows what they are having - including them! You'll do great, I'm sure of it Lisa. I'm working hard on getting our online trapping supply store put together so it can be opened sometime in the next week or so. I love the dog opener. Wow! You are so on track! You go girl!!! I am excited for you!!! Good Luck on the Marathon! I know that you are going to get through the tapering just fine! I love that bottle opener. It is so cute. Wow I have nothing exciting to say about my upcoming October but I am certainly interested in yours. Great Running!! I don't know how you do it..... and blog too! October is a slow month for us.... Thank Goodness we have no vacations scheduled and I can stay home for awhile. Congrats on a great month! My husband has started training for a marathon. LOVE the bottle opener! I am so impressed and inspired by you! I hope the marathon goes great for you. I am supposed to be training for a 5K, but . . .
A couple of pumpkin ales should help put those nerves to rest...;) Seriously, I am so proud of you and impressed! You are going to do great in that marathon! Wow Lisa... You have done GREAT... Sounds like you are really ready for the marathon. We did LOTS of hiking during our trip --and it was fun... Exercise is so important especially for us 70 yr. olds!!!!! I'll be praying for you for the marathon race.. I marvel at how many people I know are getting involved in running marathons.. Keeps the heart happy. Love the bulldog bottle opener..
Love the beer opener! I think I will pass on the pumpkin beer though....doesn't sound appealing to me at all. Wahoo - that is awesome!! You go girl! That's a whole lotta running! I love that little bulldog opener. Yes you deserved it! I'm hoping to get a lot of crafts with the kids done mid October to late October. That's when my youngest nephew starts chemo. I think I'll have his brothers, my other nephews some then. I figured that would take their mind off of their sick brother and occupied mom. Plus it will be a time for memories with my own kids to. Wow! 161 miles! I am still trying to get my mind around that. You are amazing! Good luck to you! Hard training and you deserve that ale girl! The dh and I competed in our very first 5K run/walk last Saturday and I think we are hooked! I'll never be a runner though- got bad knees from aerobics back when I was a twenty- bopper. Congrats that the hard part is over and good luck for the marathon! I saw lots of pumpkin ales today at Whole Foods.Easy to make many flavors like this.Early settlers packed a pumpkin with raw sugar and made a pumpkin rum.I like the seeds for cooking(pepitos) and snacking best, but have made a pumpkin stew cooked right in the pumpkin also. Good for you! My friend at the vet's office is running her first race this weekend. wow..good for you! you deserve that beer! Congratulations! I hope the tapering goes smoothly! You know what I think? Lisa, sounds like some awesome training. I can't imagine doing that. Way to go! The beer sounds yummy and I love the opener. All images and writing on this site are property of Two Bears Farm unless otherwise stated. Please do not copy any posting or photo from this blog without permission. You may only use a photo if you link back to that particular post with a credit to Two Bears Farm. Thank you!